Christie’s mid-season Modern British and Irish auction doesn’t boast remarkable offerings this time around. We take a look at some works that stood out for us. Eileen Agar’s No. 18 Musical Garden (1947) is a lively canvas, rich in surrealist imagery. The daughter of affluent parents, Agar went against her roots for a short while after finishing her studies in the 1920s, moving to Paris to live the artistic environment on the Left Bank where the likes of Picasso, Lee Miller and André Breton resided. There’s little doubt that the time she spent there influenced her artistic development. Agar’s contribution to modern British art can be seen in the fact that she was one amongst very few female artists to exhibit at the International Surrealist Exhibition of 1936. Having never thought herself one prior, Roland Penrose and Herbert Read were the first to label Agar a surrealist. In an anecdote from the artist’s childhood, A.S. Byatt recounts Agar's mother insisting on travelling to England from Argentina with a cow and an orchestra, believing that fresh milk and good music were essential to her well-being. It's little wonder she found such a strong attraction to Surrealism. 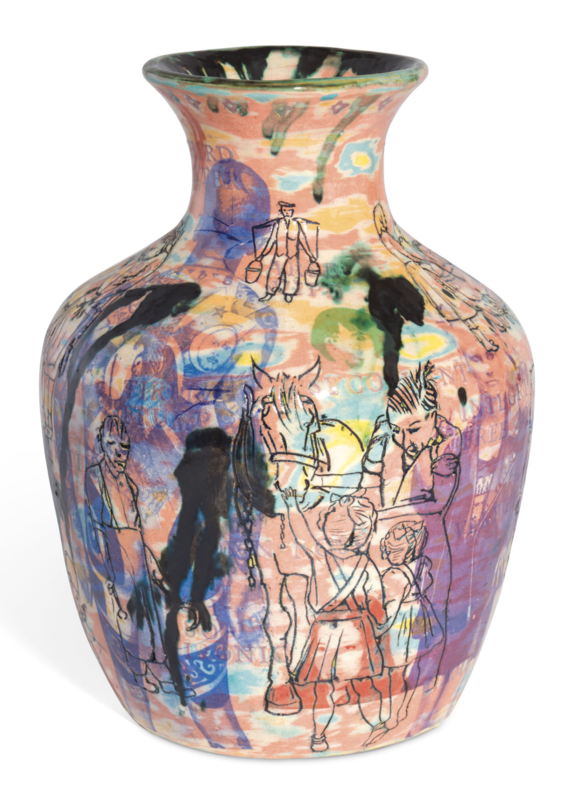 For Grayson Perry, ceramics are valuable first for their surface before their structural design and beauty. The layers of symbols, words and colours are what make Perry’s ceramics so rich. They function just as his storytelling tapestries. The Greek-style shapes of his potteries provide a stark contrast to the stories that unfold on their exterior. This piece ‘60’s Child’, reveals a confrontation not only between the contemporary and the classical, but also between the pre- and post-war generations. The sexually liberated culture of the ‘swinging sixties’ meets the backwards world of domestic life. 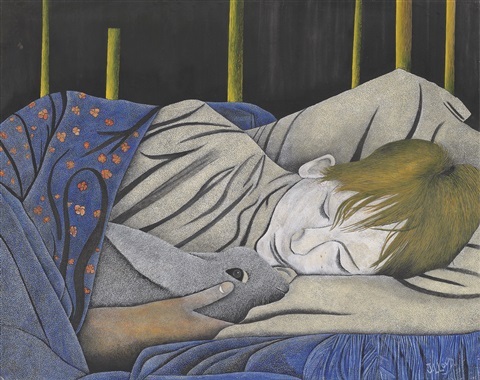 The work that most caught the imagination of bidders was James Llloyd’s ‘Boy with Pet Rabbit’. The artist, who only began painting in his 40s, was the first living self-taught artist to have a painting hung at the Tate. According to Lowry himself, Lloyd was the leading naive artist of his generation. This result was a clear auction record for this artist, selling at £40,000. It has the qualities of an early Lucian Freud, although painted using a completely different- pointillist - technique.